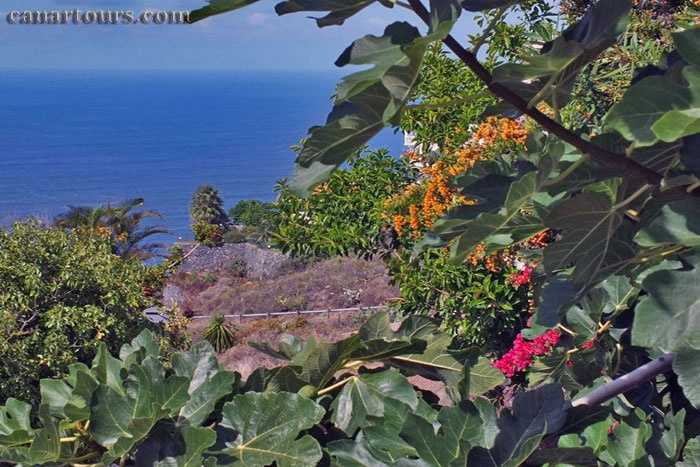 Apartment El Puntillo is one of two apartments in a private house on the north side of the island of Tenerife. The place is called El Sausal and is located at 245m above sea level. Away from the tourist places, you will find here a good opportunity to rest. The good location of the house and the beautiful surroundings invite for walking and hiking. It is a good place for people looking for peace and privacy. El Puntillo is about 60m ² and shares a kitchen, living room, bathroom and bedroom. The kitchen is equipped with all the essential cooking utensils and appliances. The living room has a sofa bed 140 x190cm, a dining table, TV with satellite channels and DVD player. The bedroom has a double bed measuring 180 x 200cm and a wardrobe. The bathroom has a shower. The terrace is equipped with sun loungers and patio furniture. An awning provides shade. The view of the Atlantic Ocean is fantastic. Washing machine, heating, bed linen, towels, hair dryer, books, games, ironing board and iron are available. There is a furnished communal terrace with barbecue facilities. There is parking at the house. Smoking is prohibited in the building. Note: There is also a bread delivery service on site. Price: The daily rent is 54 €. Each additional person pays € 15 per night. In addition there are costs for the final cleaning in the amount of a daily rent. Additional costs 29 €. El Sauzal is a very neat and peaceful village, which is beautifully situated and is considered one of the sun safest places of north Tenerife. El Sauzal counts to the best residential addresses of the island because of its exceptional panoramic views and abundant number of sunshine days and its extremely mild climate. Famous are its flowers and gardens, the cliffs, but also the typical cuisine of its restaurants and bodegas. The pre-Hispanic culture of the place with its natural surroundings and the world-class wine region gives the area its special character and make El Sauzal a coveted City. In the village there are a few shops and restaurants like Los Angeles and La Ermita. Here, in addition to the Canarian and international cuisine, a great number of fish specialties are offered. Puerto de la Cruz about 15 km.